Von Willebrand disease in dogs is a condition that closely resembles hemophilia in humans. The disease (abbreviation, vWD) is hereditary and is seen in a small number of dog breeds. 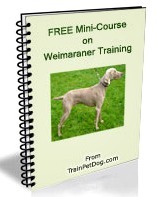 Unfortunately, Weimaraners are one of the dog breeds who can have canine von Willebrand Disease. What is von Willebrand Disease in Dogs? Von Willebrand Disease is a bleeding disorder caused by low levels or a lack of the protein known as the von Willebrand factor. The von Willebrand factor is important for regulating blood clotting. If your vet suspects von Willebrand disease in your dog, he will order lab tests. Often a pet owner is not aware of a bleeding problem in their dog, until the dog gets a minor cut or scratch and bleeds excessively. Occasionally a hunter will discover the problem when his Weimaraner get a minor scratch or cut while hunting or training for hunting. Or, sometimes a puppy may bleed a lot after a vaccination or surgery. If the blood loss is more than normal, that is a tip-off that there is probably an issue. A DNA test is available for a few breeds, and the Weimaraner is one of them. The test is accurate and you can have the test done for you by your veterinarian. 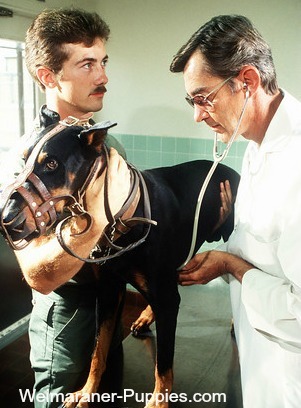 Type I – This type is the least common, and it is either deadly or the dog is a carrier for the disease, but shows no symptoms. Type II – This type is the most common form. If your dog has this kind of canine von Willebrand Disease, she may have nose bleeds, bleeding from her gums and blood in her urine or stools. Von Willebrand disease in dogs is often confused with platelet disorders. In order to be certain of the diagnosis, your vet will order laboratory tests. If your dog has canine Von Willebrand’s Disease, the treatment is transfusions with whole blood or blood plasma. Unfortunately, if your Weimaraner has von Willebrand Disease, she is not a good candidate for hunting. Bleeding from even small wounds can be excessive and dangerous for your dog.